The European Union imports around 15 times more produce from Israeli settlements in the West Bank than Palestinian products, despite its consistent condemnation of Israel‘s settlement policy as illegal under international law, according to a report. Based on figures supplied by Israel to the World Bank, the estimated value of settlement imports to the EU is $300m (£187m) a year. The comparative figure for Palestinian produce is less than $20m. “With more than 4 million Palestinians and over 500,000 Israeli settlers living in the occupied territory, this means the EU imports over 100 times more per settler than per Palestinian,” says Trading Away Peace: How Europe Helps Sustain Illegal Israeli Settlements, published by a consortium of 22 organisations across Europe. Imports include agricultural produce, such as dates, grapes, avocados, herbs, and citrus fruit; cosmetics using Dead Sea minerals marketed under the Ahava brand; and SodaStream domestic carbonation devices. Many settlement goods are misleadingly labelled “Made in Israel”. The report calls on retailers to provide clear and accurate labelling to allow consumers to make informed choices. Other UK organisations behind the report include the Methodist church, Medical Aid for Palestinians, Quaker Peace and Social Witness, and the Council for Arab-British Understanding. The report draws attention to a “discriminatory two-tier system” in the West Bank, under which settler businesses have the advantage of free movement unhindered by checkpoints and the security barrier, and greater access to land and water resources. In the Jordan Valley, where huge Israeli agricultural businesses are geared towards export, the settler population of fewer than 10,000 uses a quarter of the total amount of water consumed by 2.5m Palestinians living in the West Bank, it says. It points out that the EU is the Palestinian Authority’s biggest donor, allocating $677m last year. It cites a World Bank estimate that if Israel lifted its restrictions on Palestinian agriculture, the Palestinian economy would no longer need to depend on foreign aid. “The EU spends hundreds of millions of euros in aid each year to support Palestinian state building but then undermines this assistance by trading with illegal settlements, thus contributing to their viability and expansion,” said Phyllis Starkey, a trustee for Medical Aid for Palestinians. Settlement growth has accelerated in the past two years, since the end of the temporary construction freeze brokered by the US. According to the report, “the settler population is growing at a much faster rate (an average of 5.3% annually over the last decade) than the Israeli population as a whole (1.8%)”. It cites the EU’s position that Israeli settlements in occupied Palestinian territory are “illegal under international law, constitute an obstacle to peace and threaten to make a two-state solution impossible”. Yet in practice, says the report, the EU is sustaining the settlement project. It recommends that the EU, as a minimum measure, adopts the UK and Danish policy of encouraging correct consumer labelling of settlement produce. 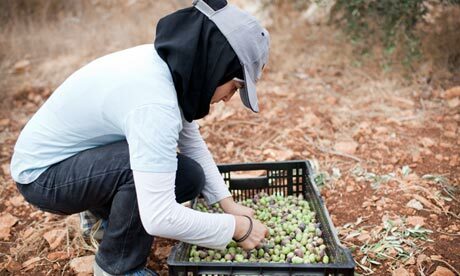 In 2009, the UK issued voluntary guidelines advising retailers that produce from the West Bank should be clearly marked “Israeli settlement produce” or “Palestinian produce”. According to the report, “the guidelines … appear to be observed by major supermarkets” and most “have decided to stop sourcing own-branded food products from the settlements”. The EU should also discourage businesses from economic, commercial and investment links with settlements, the report concludes. It also suggests the EU could, as a more comprehensive measure, ban the import of settlement goods. This, it adds, “is not a ban or boycott on trade with Israel, which the signatories to this report do not advocate”. It points out that the EU, as Israel’s leading trading partner, receives 20% of total Israel exports. Settlement exports represent approximately 2% of total exports. Agricultural products include dates, grapes, peppers, fresh herbs, cut flowers, avocados, citrus fruits, tomatoes, aubergines, cucumbers and potatoes. The main companies exporting fruit and vegetables from West Bank settlements are Mehadrin, Arava Export Growers and Hadiklaim (dates). Ahava Dead Sea Laboratories, which manufactures and markets beauty products based on Dead Sea minerals and mud, is located within the Israeli settlement of Mitzpe Shalem in the West Bank. Its products, which are exported to about 20 European countries, are labelled “Made in Israel”. SodaStream home carbonation devices are mainly manufactured in the industrial zone of Mishor Adumim, part of Maale Adumim, one of the biggest settlements across the green line. Sixty eight per cent of sales are in Europe. Keter Plastic manufactures garden furniture, storage and other household products. It has two factories based in an Israeli settlement.